This 4 bedroom beach house is in a quiet cul-de-sac surrounded by trees and wildlife, yet is in walking distance to the village of Laguna, the beach,restaurants, cafes and shopping. It has been completely remodeled with a relaxed yet high end beach vibe including walnut cabinetry, concrete countertops, custom dining table for 10-12 people, all Viking appliances, new bathrooms with concrete floors, an outdoor shower area, built in bunks in the kids room, in-built speakers and Sonus sound system, with decks off almost every room. The living area has a wonderful indoor/outdoor flow when the folding doors are opened onto the deck, which has dining for 10 people and a gas BBQ. 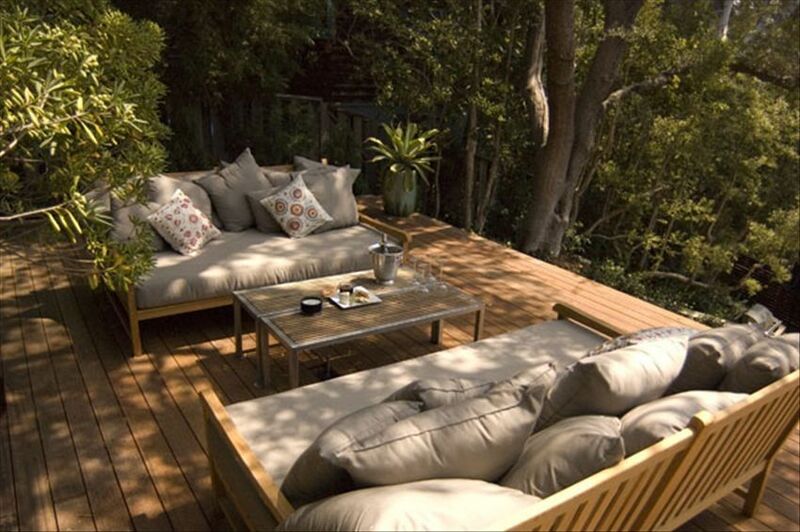 In addition, the upper deck is perfect for afternoon drinks or reading and lounging anytime. Fabrics and lights have been sourced from all over the world to give it a modern yet relaxed feel. This is a special house! This house is perfectly situated & is a great place to relax & enjoy everything Laguna Beach has to offer without the hassle of a car, mainly because of the fabulous free trolley. My husband & I were there for 5 weeks & enjoyed the wonderful local shopping & restaurants. But, without a doubt, the best part of this rental was the owner, Rebecca. We've used VRBO for ages & have not come across an owner who is so responsive & helpful & kind & considerate. Our vacation would not have been what it was without her. And wonderful tenants despite natural disasters and record rain! Thanks so much Marla and John. It was a pleasure having you both . We just returned from a fantastic stay in this home. The owner is attentive and super easy to work with. The photos are true- it's really that chic, beautiful and peaceful! Just a few blocks from the beach and downtown, you get the best of a quiet street while also being close to activities. We hardly used our car. The place is clean, lovely and homey. The kitchen is well stocked so you can cook or go out to great spots to eat. We ate out on the patio almost every evening. We didn't want to leave! My wife and 2 children (ages 3 and 5) had a vacation of a lifetime at this gorgeous house. It is in an ideal location in Laguna to explore the shops, beach, or southern california in general. The house was in immaculate condition upon our arrival, had such a open and warm atmosphere, and the the owner was extremely attentive and helpful throughout our entire stay. I would certainly highly recommend this property to anyone. We stayed at this vacation rental in August 2010. It is a fantastic high spec rental ! It felt like home away from home !! All ten people in our group (6 adults, 4 children) loved staying in this home. There was ample room for everyone and it felt spacious. The home has a very open and airy feel. The kitchen was a joy to cook in--many great appliances! We all loved the upper deck, very relaxing up there! The kids loved all the nooks and crannies and places to play. It was a nice place to stay with children. We highly recommend this home and would definitely stay here again if we had the chance. Seven long-time friends gathered for a week in this lovely relaxing home that features a well appointed-kitchen and inviting indoor/outdoor living areas. Owner was very gracious and attentive to the arrangements for our visit. A wonderful spot for a visit to Laguna. 30 day minimum rentals. Rates outside peak, last minute and multiple months are negotiable!